Cape Town, South Africa – At the close of this year’s meeting of ICCAT, the Atlantic tuna commission, WWF welcomes the respect for science in setting bluefin tuna catch quotas in the Mediterranean – but deplores the failure of member countries to impose stronger protection for vulnerable sharks, and lack of a clampdown on rule breakers. Cape Town, South Africa – At the close of this year’s meeting of ICCAT, the Atlantic tuna commission, WWF welcomes the respect for science in setting bluefin tuna catch quotas in the Mediterranean – but deplores the failure of member countries to impose stronger protection for vulnerable sharks and lack of a clampdown on rule breakers. The International Commission for the Conservation of Atlantic Tunas (ICCAT) just closed its 23rd regular annual meeting in Cape Town, South Africa. Global conservation organization WWF is satisfied with the maintenance of the annual quotas for the bluefin tuna in the East Atlantic and the Mediterranean at 13,400 tonnes but regrets the lack of progress on sharks as well as on compliance with management measures. “WWF congratulates ICCAT member countries for sticking to science again this year regarding bluefin tuna quotas in the East Atlantic and Mediterranean. This is a good sign for the credibility of ICCAT. However, failure to address countries’ failure to comply with rules remains an issue of grave concern,” says Dr Sergi Tudela, Head of Fisheries at WWF Mediterranean. After years of mismanagement, ICCAT followed for the first time last year the scientific recommendations and set an annual quota at 13,400 tonnes for bluefin tuna fisheries in the East Atlantic and Mediterranean. In spite of the lack of a new assessment this year, there was strong pressure from several countries to increase the quota, disregarding scientific advice. The EU, represented in the meeting by European Fisheries Commissioner Maria Damanaki, strongly backed respect for science. Proposals to increase the quotas were finally discarded. An important issue raised this year by WWF is the lack of traceability in tuna farms. In a study, Bluefin tuna farming growth rates in the Mediterranean, WWF highlights a potential for hiding unreported catches, and asked ICCAT member countries to urgently come up with a technical solution. ICCAT has just adopted a common procedure based on stereoscopic images that are likely to close this important loophole. “Farming is one of the least controlled areas of the bluefin tuna business, as WWF has been demonstrating for many years. 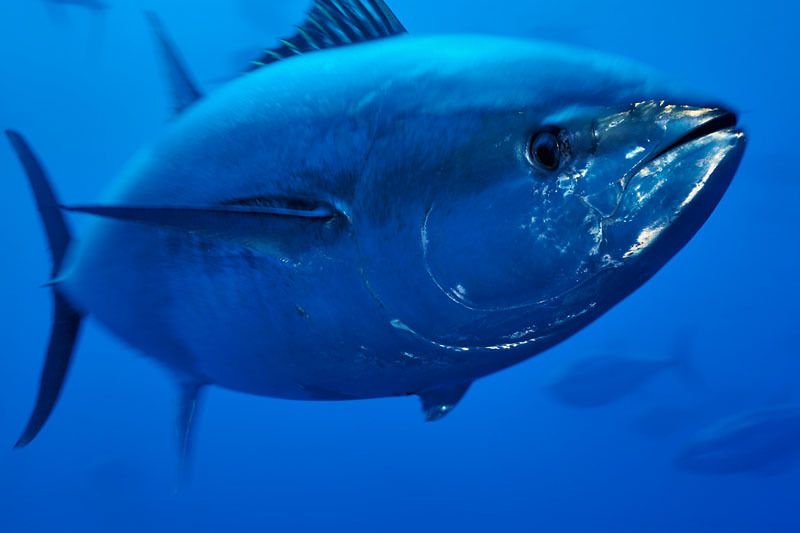 This year alone, in a Mediterranean tuna farm where control authorities used stereoscopic images, as much as 550 tonnes of live tunas were found to have been unreported. This figure is higher than the national quota of many ICCAT nations and shows a very worrying situation,” says Dr Tudela. Regarding sharks, ICCAT’s performance this year was disappointing. A proposal to strengthen the current ban on shark finning by obliging boats to land sharks with fins naturally attached was defeated by radical opposition from Japan, China and Korea. Protection of the endangered porbeagle shark was opposed by Canada. Overall, WWF is particularly disappointed by the lack of political will from ICCAT member countries to effectively address compliance issues. Following a WWF report last year which uncovered a gigantic scandal of almost 20,000 tonnes of unreported bluefin tuna traded to Japan mostly, and despite the commitment of concerned ICCAT Parties to present an explanatory report this year, only Panama complied. The results of Panama’s investigation endorse WWF’s allegations regarding likely fraud in reporting while concerned producer countries in the Mediterranean and Japan explicitly rejected any further investigations. “Mechanisms to address and ensure compliance with management measures are crucial for the credibility of any regional fisheries management organization, including ICCAT. What is essential – and what has been lacking – is a clear political will,” says Dr. Susana Sainz-Trápaga, Fisheries Officer at WWF Mediterranean. 2014 is expected to be a crucial year for bluefin tuna, with an update of the scientific assessment in the ICCAT agenda. ICCAT’s scientific committee has warned this year that more resources are necessary from ICCAT Parties to support its work on this matter. “Many ICCAT Parties criticize scientists for the uncertainties surrounding their last stock assessment results but when it comes to fund research they fail to ensure the necessary means,” says Dr Tudela. Atlantic bluefin tuna (Thunnus thynnus) is highly prized by seafood consumers worldwide for the quality of its flesh.